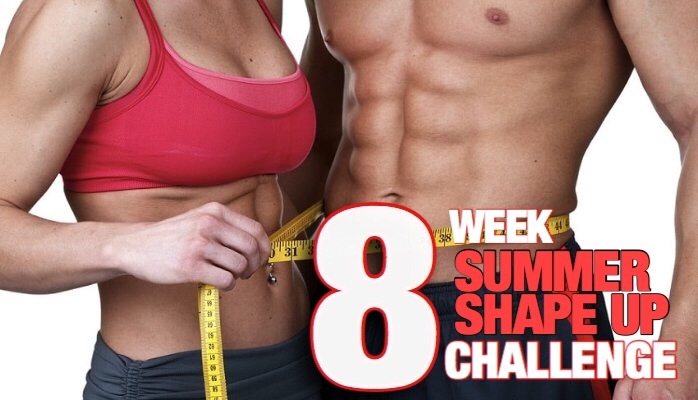 Not another 8 Week Summer Shape Up Challenge? Over the next 12 weeks, I’m going all out in the gym and with my own personal nutrition plan. I’m inviting you to join me for at least part of that journey…. 8 Weeks….ALL OUT. Log into the SHAPE UP CHALLENGE FOOD WORKSHOP (Click the pic below for access) to figure out your own customized meal plan. I will be blunt with you here; this section requires a little work. You are not going to get a plan that some “Instagram Sensation” has copied from his/her own plan. When you have completed the food plan of yours, send it to me to review. 2. Log into a few of the articles I’ve written on Strength Training and Cardio in FIT UNIVERSITY. (Click each pic for the links) Learn and apply. The bottom line here is that you need to do SOMETHING exercise wise. I will send some WEEKLY CHALLENGES for everyone as guidelines. Once completed, MESSAGE ME! Heck, message me while you are exercising to tell me you are kicking @ss! 4. Have the COURAGE to follow through AND STAY IN TOUCH with me. What’s the GRAND PRIZE for the Biggest Transformation? Your own amazing progress, a great body, and belief that you can do amazing things from here on in. What do you expect? A cheap t-shirt or a measly $500 bucks? Let’s get our priorities straight and do this FOR YOU, FOR REAL! Listen, I’m here to help. Iron sharpens iron. I’m going to get into crazy shape with or without you. It’s A LOT MORE FUN when people work together towards a common goal. YOU IN? ARE YOU SERIOUS ABOUT PROGRESS? I know my comments seem abrupt. The truth is, there is value in many programs out there. Sometimes putting an investment of dollars in place makes things more serious. What I’m asking you to do is put your pride and commitment on the line…..something a lot more valuable than money. Tell people what you intend to do. I will more than meet you half way. I don’t care if you are a sedentary person, a fit person trying to get to the next level or a a professional physique athlete, I’m completely confident in my own ability to help you, specifically, so reach out and let me know what your goal is and let’s get started. 3) 25 percent of your carbs are there to meet your calorie needs in a way that will satisfy any urges and/or the convenience factor. Ideally you should have 100 percent carbs of the highest quality with the most micronutrients but life isn’t always that way and this 25 percent buffer most likely gives you a 200-250 calorie leeway to have that tortilla wrap or protein bar. We are a Scoreboard driven society. Winning matters and getting an edge makes a difference. Create a set of numbers in your fitness quest that help you keep score; keep you accountable. WHAT SHOULD THOSE NUMBERS BE? The first two numbers will keep you accountable to your daily quotient, allowing you to stay true to your allotted macronutrients. The scale weight will help you determine a pattern from week to week of whether or not you are on the right track with your food and/or exercise. The last number also tells a story. Perhaps this may be a log of km’s walked or a weight training log showing your progression in various key exercises. By “Keeping score”, and using these key metrics in conjunction with each other, you will be able to pinpoint where things are going well as well as where there may be deficiencies. Just as a team refers to a scoreboard to get back into a game, or ease up on the contact to avoid fouls, etc, your scoreboard helps you move towards your goal. “But I don’t want to keep track of these numbers” you say? Then you are not in the game. You can’t efficiently play to win. Are there people who are winning without regard to the scoreboard? (Staying fit and healthy) Yes, of course, but those people are the exception rather than the norm. Take the Challenge….Play the game with the score in mind and watch your progress soar. MAKE IT A CONSISTENT PATTERN OF SLEEP. MAKE THAT CONSISTENT SCHEDULE A PRIORITY. This means going to bed at a reasonable time every night, regardless of day of the week, making sure that the sleep that you have is restful, and waking up at a consistent time regardless of the day. One of the biggest reasons why people go to sleep later than they should is that they try to salvage something out of a less than emotionally satisfactory day, seeking escapism like snacking and/or tv to make up for the lack of satisfaction. Part of this sleep process is making each day meaningful in some way. That’s a topic for another day, but regardless, something that I want you to be mindful of. Listing the benefits is almost pointless. You know how you feel during the day when you have had adequate sleep. You also know how you struggle when you don’t have a good sleep. Healthy Brain Function and Emotional Well-being. We mess up with our food and exercise when we are in a state where our emotions get the better of us. Proper sleep at least helps with our judgement calls. I don’t write these articles to kill time or say something just because I need to meet my weekly quota. Everything is selected with a goal in mind; that being to help you significantly change your life. If anything, this week’s challenge might be the big answer to so many of your current problems. Call to action: Create the habit tonight. Wake up at the set time and make the best of your day. Then repeat. The biggest “Bang for your Buck” comes from leg training. ONE DAY THIS WEEK, DEDICATE A TRAINING SESSION ENTIRELY TO LEGS. Report back to me, right after the workout. Remember: Go into the workout with the specific intent to not just “put the workout in” but rather to make inroads to improving your strength, muscle, heart and lungs. Give this goal some serious thought. Give yourself a good 4-6 days to go determine what this goal would do for you when achieved. This might be completely transforming your physique, taking the massive action of hiring a coach, telling all of your friends what you are going to do, and then giving away 2/3 of your clothes to good will. The easy part is coming up with the goal. You’ve been thinking of it for a long time. The hard part is finally committing to that goal and taking the necessary massive first steps to achieving it. Once those hurdles are crossed, in my experience, the rest is easy, and you become completely renewed in your focus and resolve. I’m hear to listen and help. Reach out and let me know what that goal is. This week’s challenge, foundational stuff…….. I want you to spread the weight training out throughout the week allowing you to have sufficient time to recuperate between workouts. THE KEY POINT: Adopt a healthy lifestyle as a HABIT, doing something you enjoy. Message me directly saying you completed the Challenge. At any point, you are free to message me via instagram direct message or Facebook Messenger. I would love to hear about what you did, or anything impressive that you might have done in the weight room. Create this HABIT as a LIFESTYLE CHOICE, and you will never look back. Part of creating the habit is committing to do so, no matter what. The other part is being accountable. Again, that’s what I’m here for. I want to hear from you!